Computers have advanced quickly through the decades and for a time, they were on pace with Moore’s law. However, the rate increasing processing power has slowed over the past decades as processor speeds are beginning to plateau. This means the semiconductor industry will have to be clever in its innovation. Semiconductors are not they only technology that is affected, data storage is also paramount. Since the late 1940s, we have used electromagnetism to store data. We’ve transitioned from vacuum tubes to tape drives and on to metal disks. It wasn’t until the mid-1990s that optical media became a new method for storing data. CDs and DVDs introduced a huge amount of non-volatile storage capacity. In computer terms, volatile memory is temporary and is lost when the computer is turned off, like RAM. Non-volatile memory is more permanent. The optical media like DVDs store the data permanently; the data cannot be altered once it is stored. We’ve used optics to transmit data through fiber optic tubes and lasers to store it on DVDs and CDs. Converting digital data into optical data is an easy process, but how do you bottle light and store it? For DVDs, a laser burns data onto a plastic disc; each divot corresponding to a 0 or 1. The advantage (and problem) of this type of data storage is that the data cannot be altered once it is burned onto the disc. Scientists at the Karlsruhe Institute of Technology (KIT) along with researchers from the universities of Münster, Oxford, and Exeter are working together to develop a non-volatile optical-storage unit that can be written and rewritten. 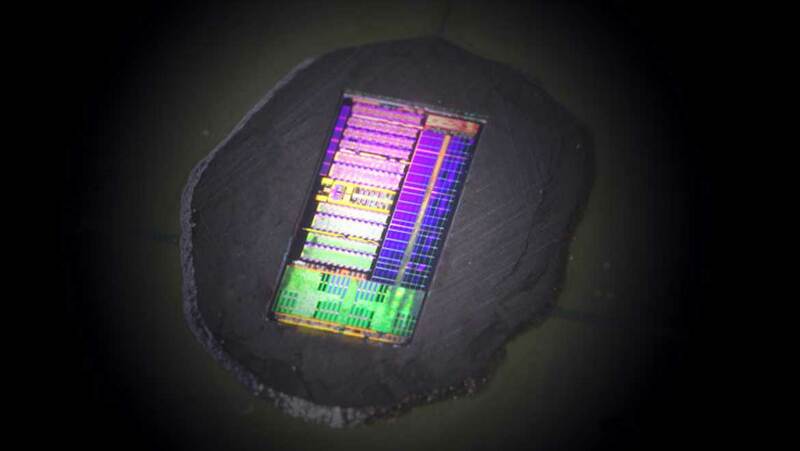 The team stresses that optical computers will operate rapidly and more efficiently, thus pushing Moore’s Law. The electronic exchange of information is reliant on the movement of electrons. Optical computing is not limited by electron movement, overcoming what is known as the von Neumann bottleneck. Electrons are fast, moving at 2200 kilometers per second, but this is less than 1% the speed of light. You can see how switching from electromagnetism to optical storage would greatly speed up processing. The team began by fabricating thin films of chalcogenide Ge2Sb2Te5 (GST). In working with GST, the researchers found that the material was optically active in both how the material absorbs and reflects light. The idea struck them in that they could use this optical property as a simple binary system, similar to how computers store data electromagnetically. When exposed to a strong pulse of light, the molecules at a specific region of the crystal will switch from a crystalline matrix into an amorphous solid. Another strong pulse will cause amorphous regions to realign into a crystalline matrix. A weaker pulse of light can then read the data stored on the chip. With the combination of weak and strong pulsing, data can potentially be stored for decades, even if removed from its power source. The KIT researchers have further expanded on their photonic films to produce integrated multi-level memory. With this newer design, storing and retrieving data can be accomplished at frequencies of up to a gigahertz. The memory chip can also store bits of data on up to eight levels in a single device. The researchers report that chip can interface with existing processors and fiber optic devices, but a data exchange must occur from photons to electromagnetism. A purely photonic system has not been developed. Photonic chips will have to develop by leaps and bound before they surpass electronic ones. The biggest challenge is storage capacity. In the short time since their discovery, the photonic chips have grown, but their storage capacity must be increased by orders of magnitude to compete against electronic counterparts. Once the capacity has been addressed, the technology can look ahead towards developing a complete optically driven computer system.